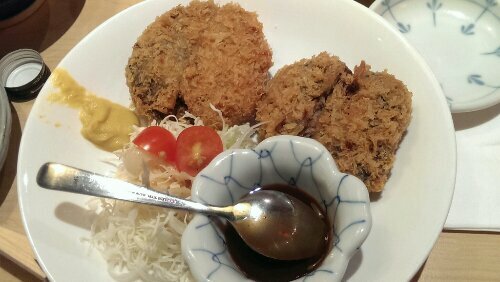 Shinjuku 新宿 @Cuppage Plaza (Singapore) | Get Your Grub On! We wanted to go to check out ‘Kazu’ at Cuppage Plaza and naively thought we would get in without a reservation. Ya, we didn’t and so made our way down story by story looking for an alternative. There used to be another yakitori place on the ground level which had moved out but ‘Shinjuku’ that took it’s place also had some meat on sticks on offer so we settled for this. 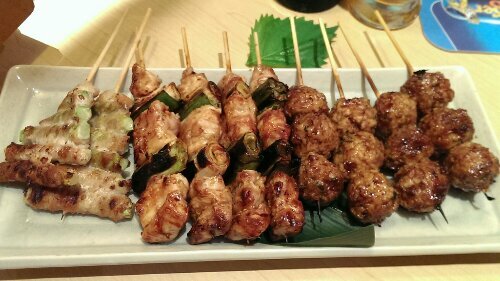 We had some ‘Yakitori‘ for starters; there was oddly tasting bacon wrapped asparagus, some okay chicken and leek but the winner here were the chicken meatballs. At first I hesitated ordering them but was very happy I did. They had a soft texture, were well seasoned and covered in a wonderfully sweet and savory glaze. Seldom had tasty chicken like that before. I found ‘Mince Katsu‘ on the menu which wasn’t very nicely presented at all but I didn’t care as it actually tasted pretty great. The minced pork was rich but not greasy and dipping it into the brilliantly sweet tonkatsu sauce finished the job. Other than that the ‘Sashimi‘ was alright, as were the ‘Udon‘, the ‘Wagyu Steak‘ was buttery good but not too special but the ‘Japanese Pickles‘ – cucumber, radish, cabbage and eggplant – i just loved them, as I do, maybe except the eggplant which was weird. We weren’t too disappointed with our evening in the end also because the staff was super nice and understanding even when the noise level increased dramatically after inhaling a li’l too much of their sake. Thanks for the nice fun evening.